Better protection for tethered or chained dogs is one of the key improvements for animals under bylaw amendments recently adopted by the Capital Regional District. At the urging of the BC SPCA, the CRD strengthened its existing bylaws to include specific recommendations on standards of care for local pet guardians. Limits on the length of time and ways dogs can be tethered. Constable Paul is optimistic about the positive impacts of the bylaw amendments. “We applaud the CRD for making this progressive step for animals. There is a huge benefit for animals when bylaw officers have the ability to educate members of the public if they see animals living in less than ideal conditions,” she says. “Once people learn more about acceptable standards, most will quickly take action to improve the welfare of animals in their care. This goes a long way in preventing the situations of abuse and neglect that the SPCA is called in to deal with.” Constable Paul says the BC SPCA is urging all CRD municipalities and electoral districts to update their bylaws to reflect the changes adopted by the CRD. The CRD bylaw amendments also provide an opportunity for members of the public to take action, either by educating themselves or their neighbours. “For example, many people don’t realize that it can be very damaging to a dog to be tethered for long periods of time,” says Constable Paul. Members of the public can also contact their local bylaw office, which can follow up on complaints and help protect the welfare of animals in the CRD. For more information, visit crd.bc.ca/animal. Humane animal care and control bylaws benefit community members and animals while also protecting public safety. When it comes to animal welfare and public safety, the BC SPCA is particularly concerned about the welfare of dogs who spend their life tethered outside with no access to exercise or ability to socialize. The BC SPCA, the Canadian Veterinary Medical Association and the Association of Shelter Veterinarians all agree that tethering – leaving a dog alone on a rope or chain for long periods of time – is an unacceptable method of confinement for animals. Dogs who are permanently tethered suffer psychological damage and may become fearful, aggressive, anxious and desperate, putting anyone who comes close at risk. A tethered dog can also become tangled and choke to death. A number of other B.C. 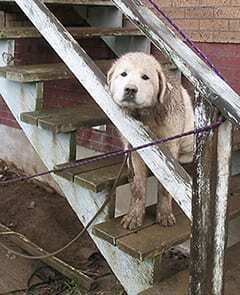 municipalities, including Port Hardy, Pemberton, Valemont, Sechelt, Oliver, Delta, Lions Bay, New Westminster, Burnaby, Sooke, Qualicum Beach, Chilliwack and Dawson Creek, have all taken steps to ensure that dogs in their communities do not suffer physically and psychologically from permanent tethering. The goal is to have all B.C. municipalities adopt a similar approach. For more information, access our review of B.C. municipal bylaws.